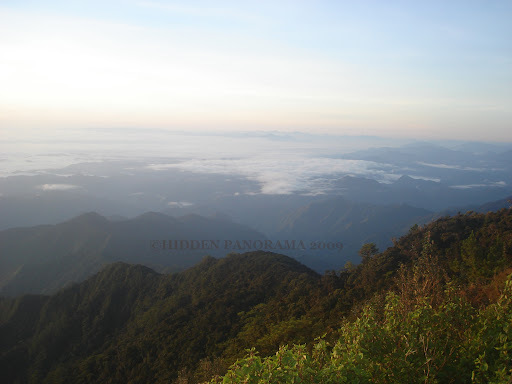 My last climb for year 2009 was Mount Amuyao which located in Cordillera region, between Mountain Province and Ifugao. This happened more than a month earlier before I flew in Singapore to another company for work. As far as I remember, this is one of the toughest climb I ever had in my mountaineering activities. Thursday evening October 15, 2009, the group met at Florida Bus station near in University of Sto. Tomas along Espana in Manila. We left the bus station around 11PM. We had a night trip and it was good for the group, the travel time was spent in resting and sleeping. Most of us woke up in the morning while still in the bus and the view that greeted us were the mountain ranges in Cordillera. when I woke up inside the bus while on our way to Banaue, Ifugao. Amuyao team went out the bus after arriving at Bissang Tam-an Banaue around 7AM of Oct 16, 2009 Friday and had breakfast in Las Vegas Banaue Lodge before going to the jump off area at Barlig to do our mountaineering business in the place. After breakfast, we rented a jeep and while on our way to Barlig, we took few minutes in one of the viewing deck of wonderful Banaue Rice Terraces which happened around 9:30 AM and there we enjoyed the amazing views that made everyone of us excited because of the scenic view that we had witnessed. After enjoying the scenic view of terraces, we took hours of traveling to jump-off place at Sitio Macalana, Barlig. While on the road, I enjoyed the outside view that I found between mountains. When I was in this situation, I really felt great because I knew I was far from the reality of life and far from the city. The falls that we saw along the road. The group arrived at the jump-off area and there we had our lunch. Next thing we did was preparing our stuff for the challenging trek since Mount Amuyao is one of the highest mountain in Cordillera ranges and in Northern Philippines. This mountain has more than 2700 masl (meters above sea level) altitude. 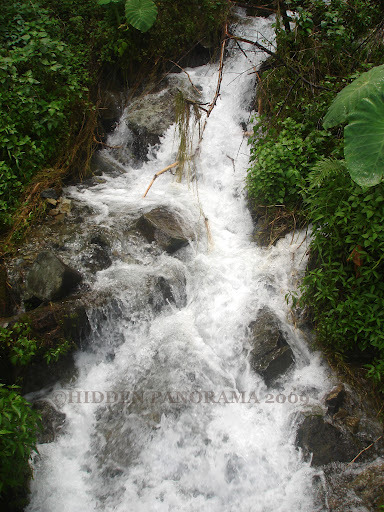 Past 2PM, the trek had been started and after few minutes of walk, I felt that the challenge had really begun. My legs started to get tired since the group took the stairs from the jump-off going down to the nearest terraces which part of our trail to the mountain. The challenge in taking the stairs was that we were forced to take the steps of the stairs no matter what height it has. Unlike the slope trail without stairs, each individual can control the pace and the steps. 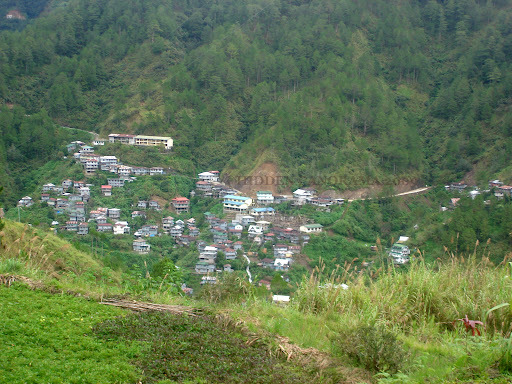 The scenic view of the terraces helped me while taking the stairs even its really tiring. While trekking the terraces, I was able to have a closer look on the rices terraces. I was surprised that the Banaue Rice Terraces that I was seeing in pictures before were different if you were actually walking on it. I can see each huge stairs taller than me and vast land with rice farming. We found nipa hut houses (“bahay kubo” in tagalog) nearby where most of the farmers are living. After we passed the rice terraces trail, the next trail we had were typical but more challenging mountain trail. It’s nine (9) hours trek or more before we reached the summit. At the top of the mountain, for me the cold temperature was terrifying and the wind blows so hard. At that time, I just wanted to get inside my tent to beat the cold wind that sweeping on us. After pitching our tent, the group had the dinner and then rested after. The group woke up early in the morning Saturday, October 17, before sunrise. And the prepared our cameras for the scenic view that we were waiting. Each one of us took all the opportunity to pose with the rising sun. It’s really rewarding while on the summit. I felt like I were in top of the world even for a moment. After taking photos, we took our breakfast and then hit another trail for descending the mountain. We had traverse climb that time which means that ascending and descending trail are different. 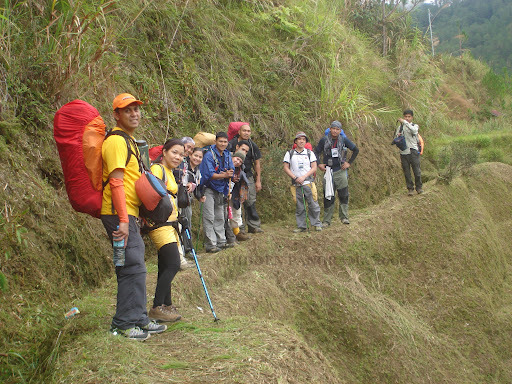 After summit, we were on our way to Patyay then to Mayoyao Ifugao. During the descent, I experienced different kind of fatigue. The group took the trail that seems not been usually used for trekking. During the descend, we discovered that our group was the first mountaineering group who did the traverse climb in Mount Amuyao. And since the climb date we had was after two weeks when one of catastrophic typhoon named “Ondoy” just hit Northern Philippines. Some part of the trail were still muddy and slippery. There were part of the trail that we also used rope for the safety of the group. While experiencing difficulty on this climb, there was part of me that I wanted to surrender and tell the group that I wanted to stop but I knew it’s impossible. All of us in the group were also tired like me. We arrived past 10:30 PM at the place where the group will rest and sleep before going to Mayoyao the next day. I remembered that aside from difficult and challenging trail, there was another thing that add up to the challenge, a friendly being that surprised most of the trekker, which is leech “blood sucker” (or “limatik” in tagalog). It usually showed up from nowhere and most of female in the group screamed every time encountered “limatik”. After a long and exhausting journey, the group enjoyed the dinner, had a little time of talking, and each of us slowly took its own place in the house to have some rest before the final descend day. Finally the last day of the trek (Oct 18, 2009 – Sunday), since we arrived at Patyay at night, we were unable to appreciate the scenic view of the surroundings immediately. 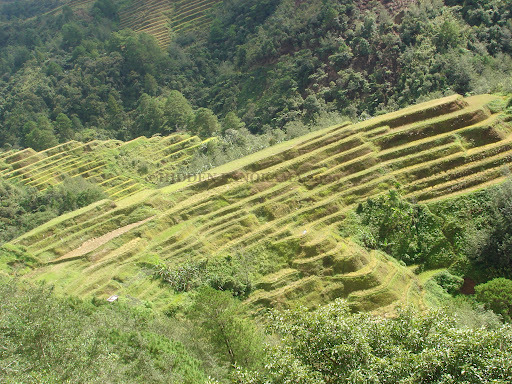 Only after we woke-up, we discovered that we were in the middle of rice terraces. In my amazement, my reaction was in awe that I couldn’t believe in myself that we were actually in rice terraces. Before I forgot, during the descent from the summit, I encountered some slight accident wherein I fell on my knees and thankful that no serious injuries. At that time it was happened it seems its nothing but during the final day of our descent, I felt for the very first time that my knees were trembling and a slight bent on my knees made me fell down and when I tried to bring up myself I faced difficulty. This kind of feeling happened to me first time after I climbed lots of mountains. My group mentioned to me that it maybe because of heavy backpack that I brought in and others told me that its because I didn’t eat enough. No matter what the cause of it, I can say at that time that I can’t really hold on to myself without getting help from others in the group. After few more hours, we arrived in Sitio Maga, Mayoyao and we had our lunch in that place. Few more hours of walking happened, then around 3PM, we found cemented trail which was a sign that were almost done in our trek. At that time I felt relief, because I knew that the tough challenge that the group had faced was over. 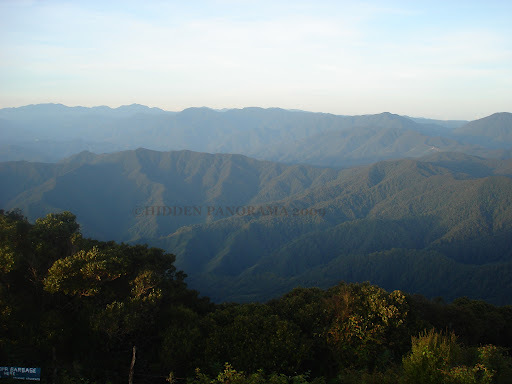 I can say that Mount Amuyao is not a typical mountain to trek without preparing ourselves. I admit to myself, I haven’t prepared so well that’s why I had so much difficulty on this climb, but even that was the case, the experience was enriching since the most important thing for me on this climb was I experienced Mount Amuyao, it’s not just like seeing this mountain from afar but its because I felt this mountain which was more rewarding that anything else.